This quick, no-fuss mustard sauce tastes not dissimilar to a béarnaise but is much simpler to make. It's ideal poured over sirloin steak (entrecôte), but equally good with salmon or chicken. Preheat the oven to 200ºC, gas mark 6. Heat 1 tsp butter in a frying pan until it foams. Add your steak and sear on both sides until well browned. Transfer to the oven and cook to your liking: 5 - 6 minutes for rare; 7 - 10 minutes for medium; 10 - 12 minutes for well done. Meanwhile, add 2 tbsp white wine to the frying pan and boil until reduced slightly. Lower the heat and stir in 2 tbsp crème fraîche and 1 tsp Dijon mustard. Season, add a few tarragon leaves and it's ready to pour over your steak. 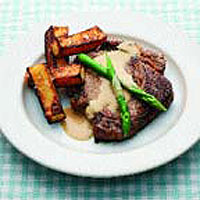 Serve with asparagus and chunky chips. This recipe was first published on Waitrose.com in June 2005.